The first mentor as a part of this interview series is Harish Keswani, Entrepreneur | Digital Marketing Expert | Marketing Consultant at BusinessMojo. In this interview Harish Keswani talks about his journey from being an electronics engineer to a digital storyteller for products ranging from laptops to pizzas. 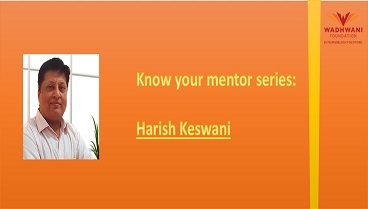 Hi Harish, thank you so much for agreeing to be a part of this interview series. We’re thrilled to have you on as our very first guest from within the Wadhwani Foundation’s mentor network. Could you please tell our readers a bit about what you’re working on currently at and outside BusinessMojo? I started my second innings in ‘entrepreneurship’ in 2012, as an independent “Marketing Consultant” specialized in Product Management and Marketing. Very soon I realized that Indian companies do not like to outsource their ‘product management’, but were open to outsourcing their digital marketing since they did not possess internal expertise for this. As of date, Business Mojo has over the last 5 years implemented digital marketing strategy for various mid sized companies mainly in the IT/Tech stream, but through references we also have clients in Renewable Energy, Higher Education, Retail and Auto sectors. Outside my core domain, during weekends, I enjoy educating youngsters about ‘entrepreneurship’ and love to conduct programs on marketing planning for startups. I also would like educators to highlight the huge opportunities in ‘product entrepreneurship', looking away from apps, which is the need of the hour for India. I personally feel that investors’ money should be invested wisely in product development before brand building. Unfortunately in recent times, I have not been able to devote all my weekends (as originally planned) to this initiative due to increased work loads. I have also got a bit disillusioned from pro-bono mentoring, since very few value or implement ‘free advice’! We’d love to understand your journey so far. How did an electronics engineer manage to turn into a digital storyteller for products ranging from laptops to pizzas? My technical background has helped me in my entrepreneurial journey in the digital world. I have over the last 2 decades ultra-refined skills in ‘customer acquisition’, including the deep insights into ‘customer mindsets’. I combined this with detailed study of ‘data driven’ customer acquisition methods on digital platforms including content driven websites and social media, thus naming my profession as “Marketing Technologists”. My passion is driving business growth for my clients, thus dabbling into multiple industry verticals in B2B and B2C has given my team the continuous excitement of learning something new, simultaneously our customers benefit from our pre-packaged research into various target customer groups. Tell us more about one or two positions you’ve held in the past that you’ve learned a lot from and how they’ve helped you as a mentor and more importantly, as an entrepreneur. I have learnt or polished many of my existing expert skills on my corporate assignment. For example, I could refine my product marketing skills across distribution channels in 9 countries including Asia, South Africa and Middle east, for over 3 years at Zenith Computers in its hey days (2002-2005) where I headed its Export Marketing. At Tata Indicom, during my 5 years there, I mastered product management and marketing at a National scale, which broadened my outlook, gave me a better handle on risk management, since there is a huge ‘fear of losses’ when a company rolls out large scale products with capex investments. I also got exposure to creating services with best of technology platforms in satellite communications and cloud computing. I will always be thankful for these opportunities without which I would not be able to gain the knowledge and skills I boast of today to my clients. What are the top 3 lessons you’ve learned over the years that you’d like to share with our readers who are either entrepreneurs themselves or aspirational entrepreneurs? 1. Write a Plan - Do not rely on mental plans and gut feel alone. Write a one-year plan at the least if not 3-year plans which are ideal. Generally I find young, wannabe entrepreneurs in a ‘rush’ and like to short-circuit this stage. 2. Invest in research and product development before marketing- Prioritize creation of a superlative product and create a great technical team on the way. Your confidence to market will increase multifold when your company has a great and unique product. 3. Hire experts where needed - No one can be an expert at all aspects of business, build a budget to hire and pay for experts services in the core aspects where internal strength is missing. How has your experience been with the Wadhwani Foundation as a mentor? Could you tell us a bit more about some of the mentees you’ve worked with and the problems you’ve helped them solve. It’s been a mixed experience, with a frequent churn in the NEN teams. While at one end it is frustrating to mentor youngsters with only ideas, but no plan; on the other end it is very satisfying to see your mentee grow their business based on my advice. I mostly focus on my expertise to help entrepreneurs build or refine their sales and marketing plan which directly impacts their lead generation and sales growth. What advice do you have for mentees who are part of the mentor connect program? How can they make the most of the program and the wisdom of mentors such as yourself? Mentees should assign a virtual value of lakhs of rupees to the advice they get from the mentors in this program. They should be thankful to NEN for providing expert advice at no cost to them. Advice should be implemented and looped back to the Mentor in order for the ecosystem to function efficiently. Where can people find you online and are there are any shoutouts you’d be interested in sharing with our readers?